A northern Michigan golf resort’s long-term, strategic planning is reaching its final stages. LochenHeath Golf Club is in the fifth year of a seven-year-plan to transition back to being a private golf club, and General Manager Kevin O’Brien reported there a lot of good things happening. Things like: the planning being complete for an initial build of two cottages in an area near the club that could eventually have five or six cottages. 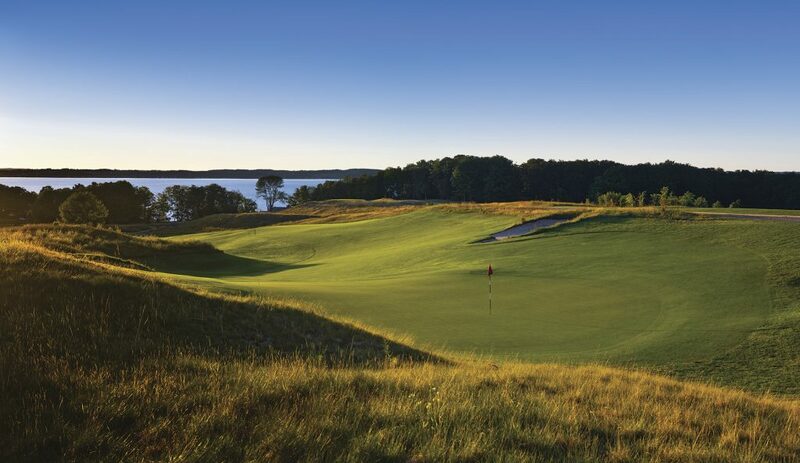 The cottages will serve as lodging for visiting national members for the highly regarded Steve Smyers-designed course hugging East Grand Traverse Bay. “There isn’t a final decision on when construction starts yet, but to have places where people get to stay on property and experience our golf course and restaurant is part of our future,” O’Brien said. “Things are going well. We have 36 new members in the last 23 months. We still allow limited outside play because we still need possible members to see what we have to offer, and we are working toward the blend of national membership and seasonal membership. That will be a great situation for our club’s health,” O’Brien added. LochenHeath’s short history is well-chronicled. It opened in 2002 as a public course with some local fanfare, went private in 2004, reverted to public in 2008 followed by bankruptcy for the then ownership. In 2010 the facility was purchased at auction by a group of 12 individuals, which included 11 dedicated former members. The golf course was restored to playable levels and reopened in May of 2011. It was then five years ago, the seven-year-plan O’Brien is charged with serving started to take shape. “We had great original members who made sure LochenHeath opened again because they knew it was a great golf course and they wanted to continue to play it,” O’Brien said. “Also, Joe Ettawagiac, a former assistant superintendent, was brought back and is our superintendent and the course has come a long way. Joe and his staff have done an incredible job, and we’ve had Steve Smyers to consult. We’ve added five new forward tees, and made it more playable, too,” O’Brien added. Outside play will still be part of next year’s plan, especially in the weeks before and following peak season for golf in northern Michigan when full membership is not using the course. Golf Digest’s most recent rankings list LochenHeath at No. 11 on a list of best courses public, private, and resort in Michigan. Adam Schriber, a noted national golf teacher, is the director of instruction and works with member golfers, which includes PGA Tour player Ryan Brehm, who is a Traverse City resident.